My realtor, Peter Spurr, automated my preferences, so once or twice a week I get an email from him with properties that match my specifications. Even though I'm no longer looking I can't help but peek and once in awhile I find a property that makes me pick up a lottery ticket and cross my fingers. This is one of those. We've passed this cabin many times. It's at the corner of Cady and Mars on the Copper Mountain Mesa. It's one 400 square foot cabin, clean and in fair shape, and a little 200 square foot-ish cabin off to the side. 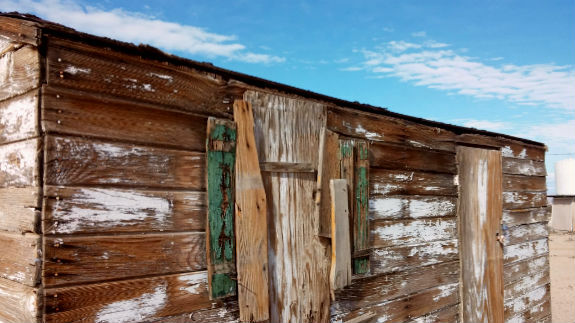 I've looked at this little wooden cabin many times and wanted to aquire it. It's just lovely, its wood aged to classic beauty. Oh, for a tractor and a complete lack of conscience! The front door of the main cabin is just lovely. I'm not a fan of shabby chic but this is the chic-est shabby I've ever seen. 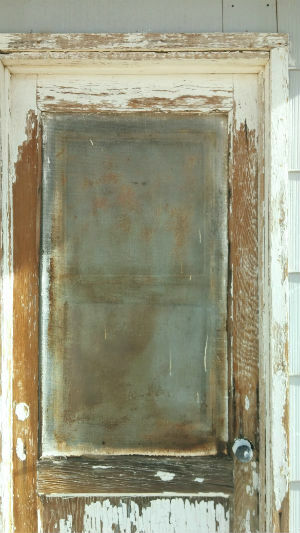 How would you maintain this picture perfect door? How could you use it as an entrance and protect it from further damage from the elements? It would be such a shame to alter it in any way. The views on this property are stunning and there are few neighbors within view. The property is flat, clean, and with the exception of one stunning cactus, without any striking vegetative features - easily remedied. 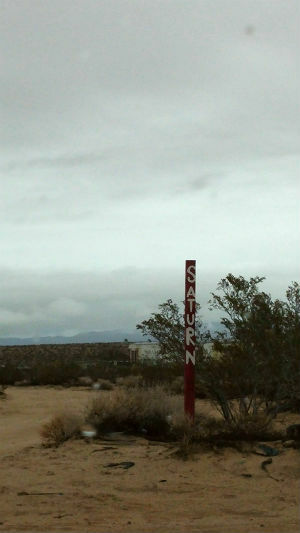 We drove to the end of Cady and noticed some civic-minded person posted a new street sign for Saturn. It was raining and so the bright red of the sign was muted. I was sorry to miss snapping photos of the "Alto" signs someone has posted in a few places where "Stop" signs should be. It's lovely living in an area where time, language and space all seem to slip. 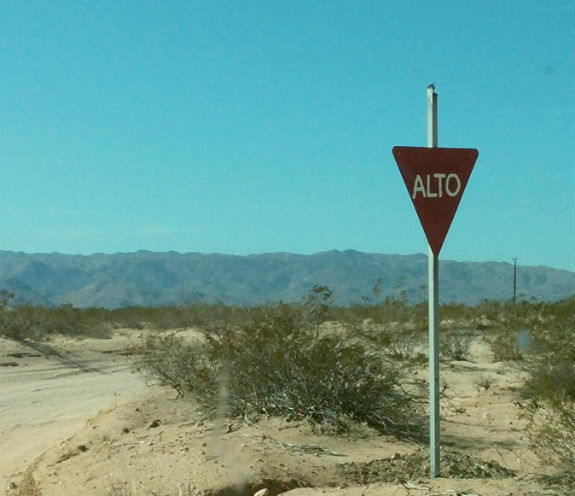 I'm sure someone with a stronger sense of propriety than I have will one day come out and at least remove the "Alto" signs. 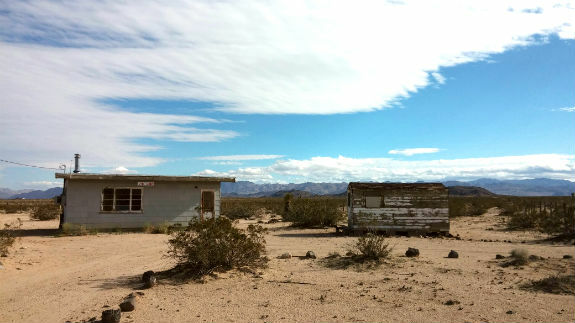 In the meantime they illustrate the independent spirit that thrives here in the Big Empty, the American Outback. If you're interested in the Cady property, contact Peter Spurr at (760) 366-7795, tell him Teresa sent you. The asking price is $29 and of course it needs work. Remember, I'll take the little cabin off your hands. Just ask.